Some executives at Northrop Grumman, Raytheon and Textron have said the U.S. military’s ongoing efforts to modernize warfighter readiness have increased opportunities for industry to offer virtual and augmented reality training systems, National Defense Magazine reported Thursday. 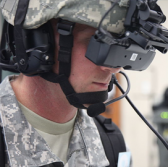 Corey Hendricks, chief engineer of global training solutions at Raytheon, noted the company integrated VR and AR tools with mobile platforms in a move to produce a collaborative training environment. Brad Swardson, manager of mobile and immersive technology innovation at Northrop, added such tools work to increase efficiency and quality of systems. John Hayward, a vice president and general manager at Textron’s TRU Simulation and Training business, said small and large companies that significantly invest in their training segments drive market competition. Multiple companies have showcased products with AR and VR technologies during the National Training and Simulation Association’s annual Interservice/Industry Training Simulation and Education Conference.